Rosedale Shire (1871-1994), an area of 2277 sq km, extended from Glengarry (north of Traralgon) to Lake Wellington, the largest of the Gippsland lakes. It also included a narrow foredune peninsula along the Ninety Mile Peninsula extending as far east as Lakes Entrance. The apparently near worthless peninsula became important after the 1950s. Rosedale road district (1869) was named after the town of that name on the Princes Highway, midway between Traralgon and Sale. The town originated in the early 1850s as the point where a track from Port Albert to Gippsland crossed the road from Melbourne to Sale. The road district became a shire in 1871 and included the areas which became Traralgon and Morwell shires (1879, 1892). Railway lines were opened through the north of the shire, from Traralgon to Sale (1877) and from Traralgon to Maffra (passing through the shire’s northern towns of Toongabbie and Cowwarr, 1883). 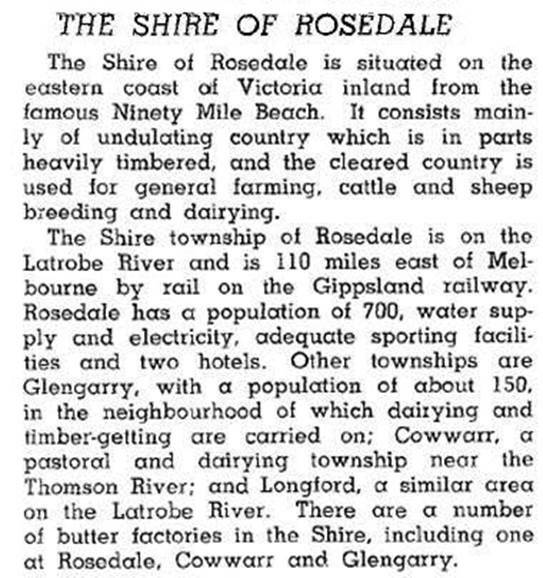 The riverine plains north of Rosedale became valuable dairy lands in the 1950s-60s. In the same decades the near worthless coastal peninsula was chosen for beach subdivisions. The largest, Loch Sport, chopped up the land into house lots. Although over 1000 lots have been built on, they are only about half the total, and remnant vegetation survives on undeveloped blocks. Another (ocean front) subdivision was Golden Beach. Further west there is the longer established Seaspray and its neighbour, The Honeysuckles. The shire council was attracted to the rate revenue from coastal subdivisions, but stored up trouble with allotments on fragile foredunes or which are prone to inundation. Coastal towns and others close to Traralgon developed urban communities, for both retirees and residents who commuted to larger centres for work. In 1994 Rosedale shire had 54% of its area under agriculture. There were 62,900 meat cattle, 47,500 dairy cattle and 133,800 sheep and lambs.